We are engaged in offering the finest quality 7mm Sandalwood Beads Mala. The Sandalwood Jap Mala made by sandalwood beads & nice work on it. Owing to our huge market knowledge, we have been able to serve our valued clients a wide range of Red Sandalwood Mala. - Red Chandan beads knotted in thread in traditional style with tassel. This red sandalwood mala is made up of 108+1 beads of about 7mm size. The beads are round in shape. This can be used for meditation purposes as well as for wearing around the neck. Sandalwood is believed to promote tranquility as an aid to meditation. Using a sandalwood bead mala while chanting is supposed to have therapeutic effects. It enhance calmness and creates a positive frame of mind. Sandalwood mala with perfect diameter and perfect hole. the sweet woody sandalwood scent is one of the most beloved fragrances in the indian culture. 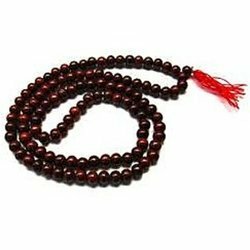 This mala is made of fragrant sandal beads of uniform size in thread with knots. 1) for empowering rituals and for worshipping all dieties. 2) it promote tranquility and is an aid to meditation. This genuine sandalwood mala is used for japa (repeating mantras or prayers). This mala is made from genuine naturally fragrant sandalwood and will never loose its aroma. Using the very best quality sandalwood, this mala features 8 mm beads and has been knitted in traditional style. We are an eminent provider of a breath-taking array of Sandalwood Mala, which suits the needs of wearers and acquired form us at very reasonable rate. With the support of our team of experts, we are engaged in providing wide range of Red Sandalwood Mala. We are remarkable entity, engaged in offering superior quality Sandalwood Mala. This is pure red sandalwood Mala made of southindian forest red sandalwood and we are manufacturer of beads we have our own factory if anyone want to contact direct to a manufacturer they can contact and can visit to this beads factory.